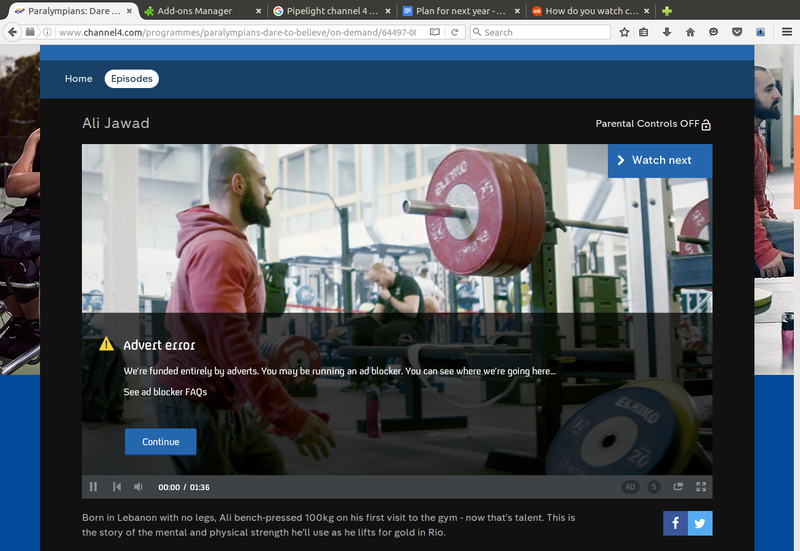 How do you watch a channel 4 video with pipelight installed and user agent overrider extension installed on firefox? I have pipelight installed and user agent overrider extension installed on firefox. I set the user agent overrider extension to Windows / IE 11. But, I get this advert error when I am trying to play a video on channel 4 http://www.channel4.com/programmes/paralympians-dare-to-believe/on-demand/64497-007. The video thinks that I have an ad blocker even though I don't have an ad blocker installed. The version of Ubuntu I am using is 16.04. Browse other questions tagged pipelight or ask your own question. Why is Pipelight attached to Geary? And how can I disable it?